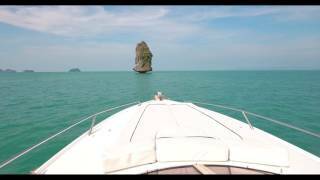 CLEAR SKY is a luxury, yet affordable, private yacht based in Koh Samui. Charter CLEAR SKY and enjoy snorkeling, sightseeing or swimming around the islands of Koh Samui. Also explore Koh Phangan, the Marine Park and Koh Tao. Book your exclusive cruise with us here, on our official website. Our aim is to give you the ultimate experience in one of the most beautiful places on Earth. Our team offers in excess of 15 years yachting experience. We provide hospitable and quality service to elite guests from across the globe. Furthermore, our team’s intimate knowledge of the islands of Koh Samui will help make your trip aboard CLEAR SKY an exclusive, safe and pleasurable experience. Please watch our video to give you an idea of some of the wonderful experiences that await you on our excursions with Clear Sky.